Welcome to Ward 5 Online: Teen Empowerment Hosts 9th Annual Youth Peace Conference! Teen Empowerment Hosts 9th Annual Youth Peace Conference! 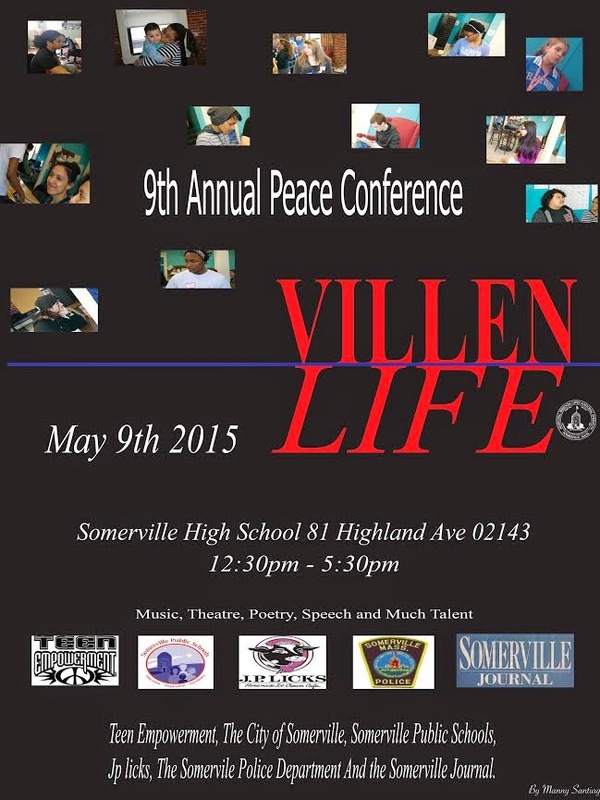 On Saturday, May 9th, 2015, the City of Somerville, The Somerville Police Department, Somerville Public Schools, and the Center for Teen Empowerment, Inc. will present Somerville’s Ninth Annual Youth Peace Conference at Somerville High School. I am writing to request your assistance in spreading the word about this important event amongst your friends and networks. The Conference will feature a highly sophisticated Teen lead show followed by a Mental Health focused community workshops from 12:30­-5:00pm. Program Director Danny McLaughlin writes, "We are expecting some 600 Somerville teens to join us for this moving and inspiring event, which will feature a sophisticated stage presentation that addresses the root causes of youth violence, mental health and other issue using the arts—including skits, music, spoken word, song, and speeches. Through these youth ­led performances, we will address some of the major issues facing Somerville residents and explore how youth, adults, police, politicians, and community organizations can work together for a more peaceful community."